It is true that a super moist lemon flavored cake and chocolate garnish would make a perfect pairing. Baking cakes for your loved ones or on your kids birthday, it is something that brings great pleasure in our lives. Though this is my first trial on lemon cake recipe, the cake came out well with perfectly moist. This lemon birthday cake is made for my elder daughter on her birthday...January 19, she is now 9 years old. She loves citrus fruit cakes than a normal chocolate cakes. 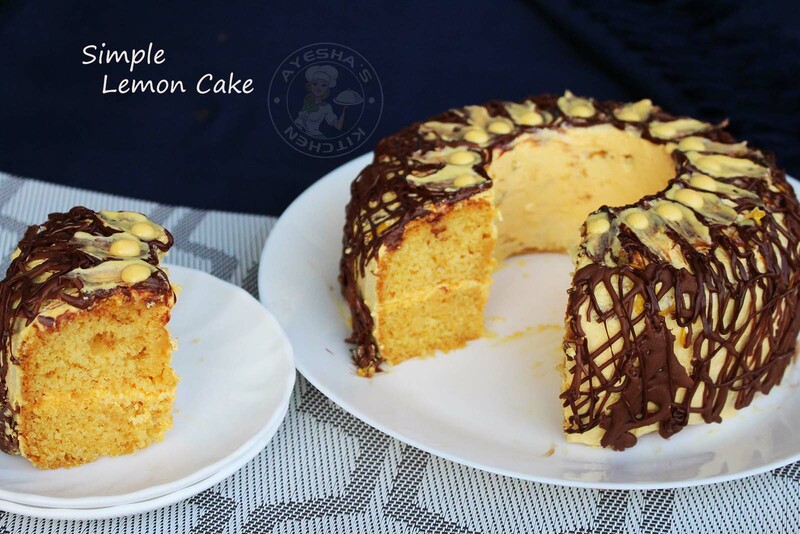 So i thought of making this simple easy lemon flavored cake with a chocolaty garnish. Chocolate frosting for lemon cake is an irresistible combination. As i told you, this is not a lemon bundt cake recipe though it looks so. 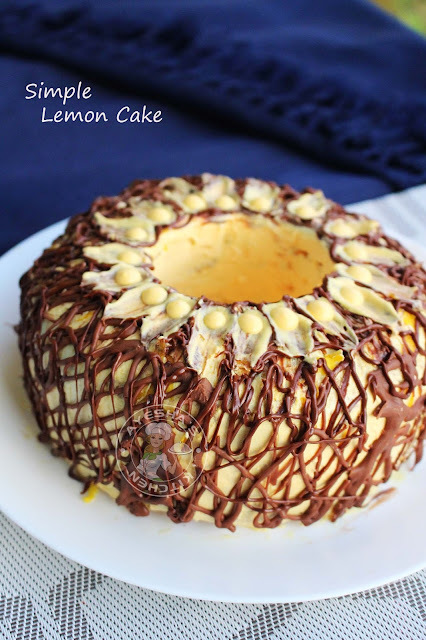 Hope this lemon cake recipe will helps you to make a bundt cake without a bundt cake pan. Yes, you can make your bundt cake in a normal cake pan. Though there are many other tips like placing a buttered can in the center of a baking pan and like so...i prefer trying this. Here is the recipe showing how to make the best lemon cake / moist lemon cake recipe /recipe for lemon cake / lemon bundt cake. Enjoy!!! Grease the baking pan with a tsp of soft butter and then dust with flour, tap out the excess flour. Keep the pan aside. Sift together flour, baking powder, baking soda and salt. When done, mix well and set this aside. Take a large bowl, add eggs and sugar. Whisk this well until fluffy. Add vanilla essence, lemon juice, food color one by one and whisk well. Now add in the sifted flour mixture and fold it gently with a spatula or spoon. Never beat using a beater after adding flour mixture. You will get a airy textured batter. Pour it into the prepared pan and bake it for 30 - 40 minutes. Every oven varies in time and temperature. Keep this in mind while baking. Check the cake by inserting a tooth pick (preferably after 30 minutes only if you are not sure about your oven temperature) and if it comes out clean, then the cake is done. When done, transfer the cake tin from the oven and let it cool completely before removing from cake tin. Cool the cake completely before icing the cake. Now lets start. Add whipping powder in the chilled bowl. To this add cold milk little by little, vanilla essence (optional) and orange food color .Whisk with an electric whiskers until soft peaks are formed( it will take around 3 minutes). Whisk over a high speed, off the whisker. Again whisk over a medium speed, off the whisker. Like so, repeat until soft stiff peaks are formed. 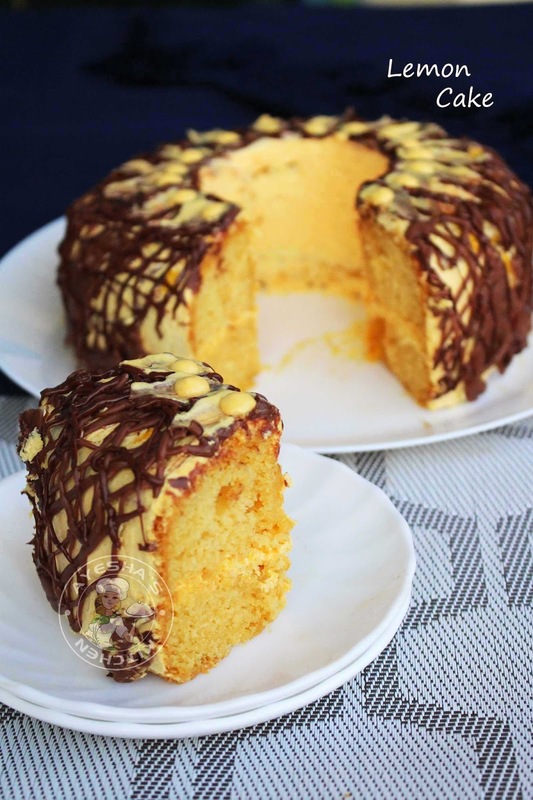 Once, one of my readers asked me how to make bundt cake using normal cake pan. Since i didn't tried the same yet, i was unable to give a detailed reply. So i just thought of trying the same with this lemon cake. For that, make the normal round shaped cake and then make a small ring shape in the center by pressing the cake with a round cookie cutter or anything like that. Now you will get a ring shaped cake and then divide the cake into two layers. Frost one cake layer with the prepared whipped cream and cover it with the other cake layer. Then spread the whipped cream all over the cake. Sprinkle some lemon zest (optional). FOR CHOCOLATE GARNISH - Melt the dark chocolate, i used dairy milk chocolate. You can do this by putting the chocolate in a piping bag and then dip the piping bag in a cup of hot water until it melts. Take a butter paper, cut the tip of the piping bag, make designs, keep refrigerated until it sets. Once sets, garnish the cake. Chill the cake for few hours for a perfect slice.